Newly constructed barricade webbing assemblies may be brought out of storage and used as follows: If used for three practice rigs, it can still be used as a "ready" barricade for engagements. If used for four or more practice rigs, it cannot be used as a "ready" barricade. 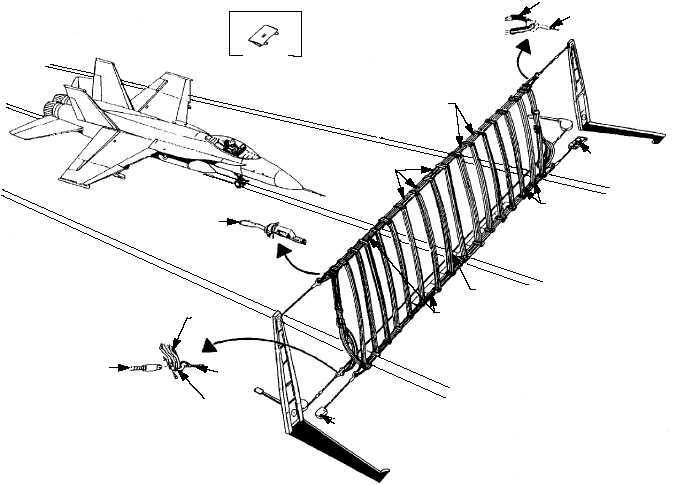 When an aircraft is required to make an emergency landing, the nose of the aircraft passes through the barricade and allows the vertical (engaging) straps to contact the leading edges of the wings and wrap about the aircraft (fig. 3-37). The barricade installation then passes the force of arrestment through the purchase cable to the arresting engine. After arrestment, the barricade and attached hardware are discarded. Currently, there are two types of barricades (two configurations) available to the fleet. Both types consist of all-nylon webbing assemblies, placed one on top of the other and bundled together to make up one barricade installation (see fig. 3-36). The polyurethane semicoated barricade uses three separate webbing systems to make one main webbing assembly Each semicoated barricade webbing system is composed of upper and lower horizontal load straps (see fig. 3-36) joined together at the ends by nylon velcro tie-down straps. (The rolled edges of the upper and lower load straps are coated with polyurethane to reduce wear and damage caused when the barricade is dragged into position for use.) Vertical engaging straps, are looped around the upper and lower load strap of each webbing system and sewn.. The spacing between the vertical engaging straps affords equalized loading of the barricade during arrestment. One webbing assembly, effects equalized loading every 4 feet along the wing's leading edge 3-36 ABE3f0337 RELEASE STRAPS VELCRO TIE-DOWN STRAPS THREE WEBBING ASSEMBLIES ANCHOR ASSEMBLY ENGAGING STRAPS REFER TO VIEW A LOAD STRAPS EXTENSION LOOPS EXTENSION PENDANT U-SHACKLE PARALLEL PENDANT WINCH DECK RAMP VIEW A BOOT PELICAN HOOK ASSEMBLY Figure 3-37.Emergency arrestment.